At this point, woodturning is our hobby not our vocation. We create functional pieces like cheese plates, boxes, bottle stoppers or salad bowls as well as ornamental pieces that are meant to be displayed like hollow forms or holiday ornaments. The wood lathe allows the turner to create interesting forms that accentuate the natural beauty of domestic and exotic hardwoods. 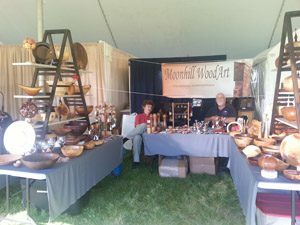 Reid is an active member of the Central New England Woodturners (CNEW) who meet monthly in Worcester, Massachusetts. The CNEW website at www.cnew.org may be of interest to anyone who would like to know more about woodturning. We will have a table at St. Vincent’s Hospital in Worcester in December 2018. We don’t know the dates yet for this show. 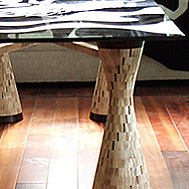 In addition to the items shown on other pages of this website, we have made more elaborate items like the segmented table legs shown below for a glass table top.